"You're the Europe editor," say the BBC powers that be. "Tell us what to look out for in 2018." Yet if we've learned anything at all from the last couple of years in European politics, it's that hedge betting is a far more comfortable path to take than prediction-making. A year ago who could have foreseen the Macron phenomenon, taking over the French presidency and dominating the country's parliament? Who, last December, predicted with any certainty the current painful contortions in German politics or the timings of the Catalan independence explosion? But Brexit, we knew, would dominate the EU agenda to a large extent, as it will again in 2018. How we laughed - in hollow tones - when European Commission President Jean-Claude Juncker insisted a while back that only 15 minutes per week would be spent talking Brexit in EU circles. The future of Europe, he insisted, was far more important. In 2017, the EU's future certainly seemed brighter. United over Brexit, the once squabbling member states fell, obediently, in line behind their chief negotiator, Michel Barnier. The eurozone was on the up, illegal migration figures down. 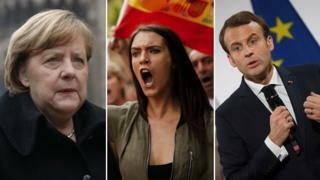 Right-wing populist, anti-establishment, Eurosceptic politicians failed to reach pole position in election after election; such as in the Netherlands, France, Austria and Germany. But the EU apple was actually never as shiny as all that in 2017. They may not have won outright, but Eurosceptic populists performed phenomenally well in elections across Europe - most recently in the Czech Republic, which hosted a meeting of European far-right parties in December. The populist discourse has also bled into mainstream politics as traditional parties scrabble to get ahead in the polls. Just tune in to the Dutch Prime Minister Mark Rutte to get a taster. Or take a look at the new government in Vienna. Anti-immigration, Eurosceptic and anti-political Islam messages no longer raise eyebrows in Europe. In fact, these themes look like vote-winners in Italy, heading for elections in spring 2018. So, to steady the EU course and strengthen resolve, Brussels nursed the hope of a new, roaring Franco-German motor at the European helm after Emmanuel Macron became France's president in April. This is something I'll be watching closely in 2018. M&M - aka Merkel and Macron - certainly want to work together. He needs her to boost his gravitas and to get any of his ambitious eurozone reforms passed. And she needs him to re-energise her sagging image. Most Germans describe France rather than the US as their closest ally these days. They are charmed by Monsieur Macron (though hesitant about his plans for the euro). In 2018, I'm interested to see if Mr Macron - dubbed "the emperor" by some - lives up to the hype at home and abroad. Or will this be a case - rather like Barack Obama who famously received a Nobel Peace Prize before he really achieved anything - of peaking too early? Mr Macron's EU BFF Angela Merkel is certainly in no fit state to purr as part of anyone's motor. Formally known as the Queen of Europe, she'll spend the first months of 2018 focusing inwards while she tries to cobble together a new government. This will inevitably impact the wider EU. As leader of the bloc's biggest, richest nation, Chancellor Merkel pushed for EU vigilance vis-à-vis Russia, prudence when it comes to Donald Trump and involvement in trying to contain Iran. A fervent believer that EU unity is in Germany's best interest, she liked to keep her beady eye on the bigger picture and her finger on the EU control button. Her waning influence plus the huge gap the UK will leave behind when it quits the EU has other member states now jockeying for position. 2018 will give us front seats in Europe's bear pit. Sweden, Denmark and the Netherlands - as well as the countries of central and eastern Europe - want to avoid what they view as protectionist, federalist France gaining the upper hand in EU debates. They're also keen to have less, not more, Brussels in their lives. And they're not unhappy to see a weaker Germany. So much for the EU unity touted by Brussels; much boasted about in Brexit talks. There was a lot of it about in 2017. But then, EU countries had a common goal: money - getting the UK to agree to pay as much as possible in terms of financial liabilities before it leaves. But in 2018 we move to phase two of Brexit negotiations: talk of the future. And here the 27 European nations differ in what they're prepared to offer the UK - a bespoke deal, or not, and in terms of EU rule-bending. Then 2018 is going to be quite a revelation.